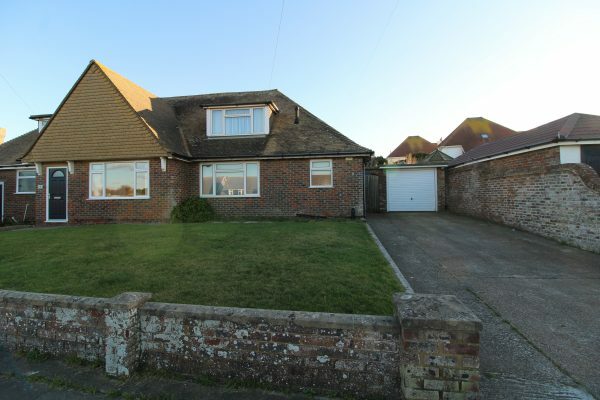 An extended three bedroom semi detached chalet-style property, located in this popular position close to Seaford Head golf course and within short walking distance of the delightful seafront promenade and beach. The town centre, with its wide range of shopping amenities and railway station, is less than one mile distant. On the ground floor the accommodation consists of a shower room, bedroom three, extended L-shaped sitting/dining room and kitchen. On the first floor are two double bedrooms, with the master bedroom benefiting from views over neighbouring properties towards Corsica Hall, Martello Tower and the sea. The property, which is being offered for sale with immediate vacant possession and no onward chain, has the benefit of a landscaped rear garden, off road parking for several vehicles and a detached garage.